The number of polar bears in the Arctic is declining fast. Due to a shrinking habitat and lack of food caused by floods, droughts, and heatwaves, less than 25,000 are left in the wild, according to the nonprofit organization Polar Bears International. Sea ice loss for polar bears means reduced access to food because these Arctic predators depend on the ice to catch marine mammals such as seals. The increased flooding has resulted in more frequent drowning and polar bears are experiencing a drop in body condition. Near the southern Beafort Sea, for example, the population dropped from 1,500 to 900 between 2001 and 2010, a 40 percent decline. Scientists predict that as the Arctic continues to warm, two-thirds of the world’s polar bears could disappear within this century, according to Polar Bears International. But polar bears are resilient and they are adjusting their way of life to adapt to the changing climate. When the going gets tough and there’s slim pickings in the food department, polar bears have a backup plan: goose eggs. Since the sea ice breaks up earlier in the year now, polar bears are missing out on opportunities for seal pups, but they’re gaining new access to ground nesting birds like geese, according to a 2011 study in the Oikos Journal. The eggs compensate for some of the energy lost from lack of seal hunting opportunities, but impacts goose nesting populations. Polar bears have had to resort to longer swims in search of sea ice, which causes a drop in their body weight and reduces energy reserves. Polar Bears International tracked a female polar bear that swam 426 miles over nine days without finding a resting place. Fortunately, the snow geese population will not be at risk of extinction from the decreases in nesting populations because they aren’t always onshore when polar bears arrive. In those out of sync periods, the birds have a chance to increase their numbers. Polar bears typically don’t like leftovers. And if they have to eat leftovers, they would rather it be a seal. But a research team in Svalbard, a group of islands in the Norwegian Arctic, reported in a June study that they saw a polar bear covering the other half of its two-dolphin meal with snow. This type of behavior is considered “untypical” according to the study. But the more interesting anomaly was that the polar bear had feasted on white-beaked dolphins, which had not been among its long list of known prey species. The team reported that white-beaked dolphins are frequent visitors to Svalbard waters in summer, but had not been previously reported farther north in early spring. They suspected the dolphins got trapped in ice after strong northerly winds, thus providing the opportunistic hungry predators a new treat. Polar bears are surviving, but they are considered a vulnerable species by the International Union for Conservation of Nature, with sea ice loss being the biggest threat to their survival. Their ability to thrive depends on where they live. In the United States, polar bears are listed as a threatened species under the Endangered Species Act. Russia and Canada have applied similar classifications. 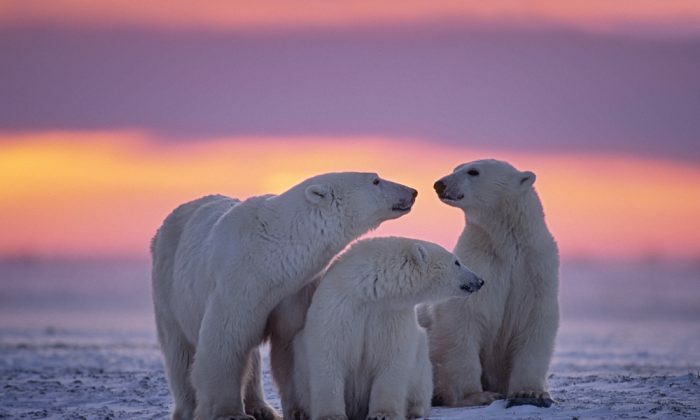 Out of the 19 populations of polar bears around the world, three are declining, six are stable, only one is increasing, and nine have insufficient data.